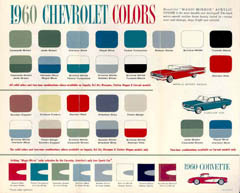 This brochure shows all of the single and two-tone paint options available on Chevrolet cars for 1960. These include all full size passenger cars, plus Corvair and Corvette. Item viewed 30627 times, created on 2009-01-29 18:22:59, last modified on 2009-01-29 19:41:38. CLICK THUMBNAILS BELOW FOR FULL SIZE IMAGES.